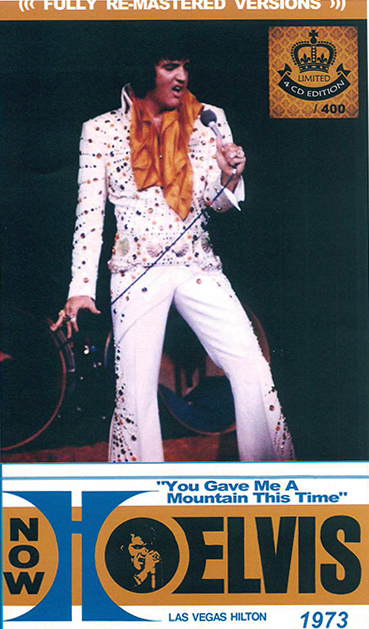 Due for release from the Rock 'N’ Roll Majesty import-label is the 4 CD longbox “Elvis 1973 - You Gave Me A Mountain This Time”. It contains the February 2, 1973 Midnight Show, the February 3, 1973 Dinner Show, the February 10, 1973 Dinner Show and the August 20, 1973 Midnight Show, all recorded at the Hilton Hotel in Las Vegas. Very perceptive review and your use of the "crap" word is SO original. Isn't the only reason you would buy this if you don't already have the shows or am I missing something? As for "quick buck crap" , ALL bootleggers are doing it to "make a buck". Although I won't be buying this, I can never understand the howls of protest if someone has the nerve to put out a bootleg containing previously bootlegged material. What is the problem exactly? BEEN WAY, way too many OF THESE CHEAP RIP-OFF COMPILATIONS recently -all done to make a little easy money!~ why would you buy unless you didn't have any of them? Try to get the former releases...dont support this quick buck C-R-A-P.
Is this for real? The redundant crap just keeps coming; talk about trying to make a fast buck. Wow! Fully remastered versions, too. Wow.